If you’ve recruited someone who is clearly struggling a few months into the job, you probably have a terrible sinking feeling of wondering if you made a hiring mistake. But you shouldn’t panic yet. What can you do? Review the onboarding you undertook. Did your new hire get a structured and thorough introduction to their role, the team, the company and culture (vision, values and ‘how things work around here’)? Sometimes our workload gets in the way and a new employee’s introduction to their new role, team or company may be a bit light as a result. If this is the case it’s worth going back and covering the fundamentals with them again to get the foundations firmly in place. Read our guide to onboarding. Next consider if you’ve set clear goals and expectations. 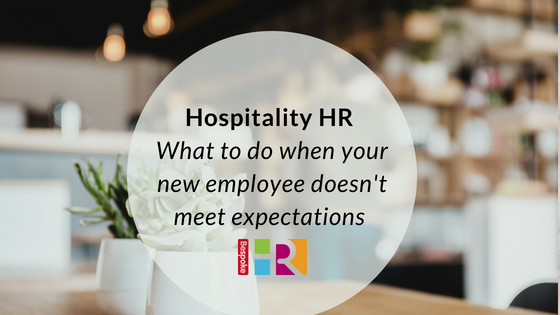 It’s critical that new employees understand what is expected of them from the outset. Have they been told or shown what good performance in the role looks like? Have they received regular feedback on their performance from their manager or supervisor? Do they have a buddy they can turn to for questions or check they are on track? Are their goals in the initial stages of their new role realistic/achievable? Are you expecting them to pick up too much too soon? What immediate support or development could you provide to help them get up to speed? Some simple changes or adjustments or providing additional support may make all the difference to your employee’s performance in the first few months. If you feel that you have done everything you can to give your recruit the best start in your company, you will need to think about what steps you take next. The best place to start is an open and honest conversation with them. Solicit feedback from others they work with if appropriate to help you to explain what the problem is. Be clear about what the expectations are for the role and why the new starter is not meeting these. It’s important to be explicit and not to talk in general terms. Explain what the consequences might be for the employee if they do not improve. Ask your new starter what they think the problem might be and what support they might need. You will have to determine if any requests can be accommodated, for example if they want to go on a training course to improve their Excel skills. If you cannot meet these needs, you will have to determine if the employee can do the role effectively going forward. If you think the new starter can move forward from the conversation in a positive way, ensure you set up regular performance reviews with them so that you can monitor their performance and provide regular feedback to keep them on track. If you feel that despite everything you have done, and you may be able to do, your new starter is not going to be a good fit for the role and the company it may be best to part company at this point. Read our guide to appraisals. Whilst it is not good to dwell on the situation and beat yourself up when things don’t work out, it is worthwhile reflecting on what went wrong. You may wish to look at your recruitment and selection processes – did you have a clear set of criteria to base your recruitment decisions on? Did this person meet that criteria? Did you ask the right questions at interview? Did you undertake sufficient pre-employment checks? Would you introduce some testing or work-based assessment next time around? Also think about how you will do things differently next time. We can help with performance and development, as well as redundancies. Get in touch for a free 15-minute confidential chat.